France Football has named 10 of the world’s best young footballers for 2018. Christian Pulisic, Kylian Mbappe and Trent Alexander-Arnold. 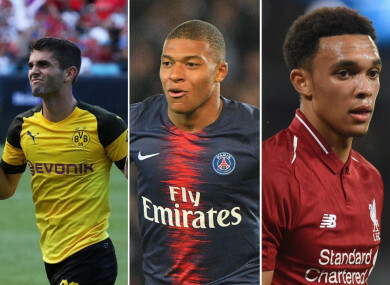 PSG’S WORLD CUP winning forward Kylian Mbappe faces competition from Gianluigi Donnarumma, Christian Pulisic and Trent Alexander-Arnold for the inaugural Kopa Trophy. The shortlist of 10 players nominated for the award — for the world’s best male U21 footballer — has been published by France Football, which also oversees the Ballon d’Or. Cristiano Ronaldo and Lionel Messi are on the panel that will vote on which of the 10 nominees should win the award, with the shortlist announced by the publication on Monday. Mbappe’s achievements will be hard to beat in a year that saw the 19-year-old help PSG to the Ligue 1 title in his first season at the club before scoring four goals for France as Les Bleus won the World Cup for a second time. He goes up against fellow Ligue 1 player Houssem Aouar of Lyon, as well as a trio of Serie A starlets in Roma winger Kluivert and Milan duo Donnarumma and Patrick Cutrone. Liverpool full-back Alexander-Arnold is the sole Premier League contender and he is up against Borussia Dortmund’s Christian Pulisic, Amadou Haidara of Salzburg, Groningen’s Ritsu Doan and Rodrygo Goes of Santos, who has agreed to join Real Madrid..
Mbappe is the only player on the shortlist for the Kopa Trophy who has also been listed among the nominees for the Ballon d’Or prize, which has been won by Cristiano Ronaldo in each of the last two years. France Football also announced the 15 nominees for the women’s Ballon d’Or with Brazil’s Marta, United States stars Megan Rapinoe and Lindsey Horan, England duo Lucy Bronze and Fran Kirby, Canada’s Christine Sinclair and Lieke Martens of Netherlands all shortlisted. Also in the running are France trio Wendie Renard, Amandine Henry and Amel Majri, Australia’s Sam Kerr, Japan’s Saki Kumagai, Germany’s Dzsenifer Marozsan, Denmark’s Pernille Harder and Norway’s Ada Hegerberg. Email “Mbappe, Pulisic and Alexander-Arnold all shortlisted for inaugural Kopa Trophy”. Feedback on “Mbappe, Pulisic and Alexander-Arnold all shortlisted for inaugural Kopa Trophy”.